Sodagreen Walk Together Tour – New date and venue announced! 12 July 2013 (Kuala Lumpur) –The concert by popular Taiwanese indie band Sodagreen Walk Together Tour - Kuala Lumpur, which was unfortunately postponed due to the Malaysian General Elections, finally has a new date! 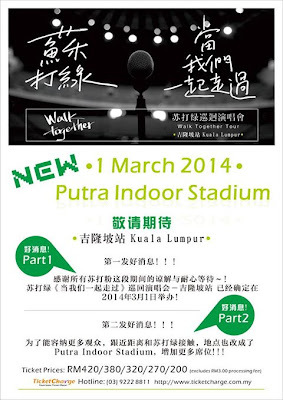 Initially slated for 4 May 2013, the new show date will be on 1 March 2014, Saturday. 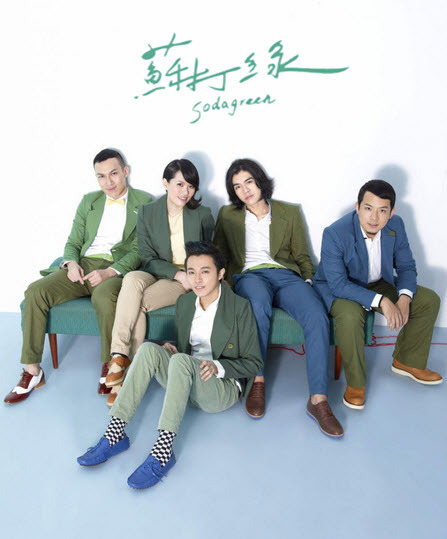 To accommodate a larger audience and allow for more fans to be able to experience Sodagreen’s music live on that night, the concert venue has also been changed to Putra Indoor Stadium. Members of the public holding existing tickets for the 4 May 2013 show will have to do a full refund through TicketCharge and repurchase new tickets for this new show date. To thank those who have previously purchased tickets and ensure that they would be able to repurchase their desired tickets, one-week priority sales will also be extended to all members of the public who had previously purchased tickets for the 4 May 2013 show. The date of the new ticket launch will be announced soon. Members of the public who have purchased tickets will receive a full refund of their tickets, inclusive of the RM3 TicketCharge Processing Fee through the original source of their purchase.Additional charges previously borne by the customer (RM1.50 Internet Fee and RM10 Handling/Courier Fee if applicable) will also be fully refunded. For customers who have purchased tickets through TicketCharge via credit card, a full refund will be made to their credit card within 15-30 days.All customers will need to return their original physical tickets to TicketCharge head office and fill up the Refund Form together with their bank details etc. Outstation/overseas customers can email TicketCharge and courier back their physical tickets. For those who have made cashpayment via TicketCharge counters, a full refund will be administered by TicketCharge within 2 weeks via cheque. All customers will need to return their original physical tickets to TicketCharge head office and fill up the Refund Form together with their bank details etc. Outstation/overseas customers can email TicketCharge and courier back their physical tickets. Customers can either choose to go down to the TicketCharge Head Office 2 weeks later to collect their cheque refund or request for TicketCharge to bank it in for them. For all queries on refunds, members of the public can contact co-promoter Supreme at info@supreme-ep.com.my or (03) 7728 3226 (Working hours 9:30am-6pm).